When Pip Bentley aged 14, took her first bus journey to Osmaston Road from the village of Melbourne in December 1946, little did she know that this was to be the start of a forty year career at Royal Crown Derby. Despite her aspirations to do secretarial work (she had managed to secure an offer of a job through school but it didn't start for two more months) her father, aware of the job difficulties at the time and anxious for her to find paid employment quickly, insisted that she should apply to Royal Crown Derby as an apprentice gilder. Following a successful interview she began work at the factory on the 2nd January 1947. She recalls her apprehension at arriving in Derby which to her was "a very big and frightening city", rather different from life in Melbourne. In the event Pip was placed in the enamellers department where Joan Midgley was in charge of training the apprentices. This image shows Joan Midgley training the apprentice enamellers and was probably taken in about 1948. Pip is the furthest away of the two girls in the bottom right corner of the photograph. In an article in the Derby Telegraph of Monday 4 February 2013 Pip explains that "Although I wasn't particularly artistic, I was very precise and had an eye for detail". She didn't like the job at first because she "would come home covered in red paint (and smelling of turpentine). Once I got used to it I loved it. Some of the pieces had paint outlines which we filled in. We started in what was quite a small room with about 20 women. A few years later we moved into a really big room which had the enamellers and gilders working together." Pip completed the training period painting with red enamel and then progressed to painting the roses on the Posie pattern. Her hours were 8am to 6pm Monday to Friday and 8am to 12.30pm Saturday. This meant catching a bus to work at 7.05am and then the bus home at 6.10pm - a long day for someone just out of school. In her account of her career in Royal Crown Derby (John Twitchett and Betty Bailey revised edition 1988) Pip recalls that "about 10am somewhat dubious beverages arrived in the work-room and were usually drunk through thirst rather than for pleasure. The mid-day break was mainly to eat our own sandwiches bought from home, although there was a contraption which would bake potatoes, and a small room served in place of a canteen." Life was not all work and no play. As a dare aged just 15 and when Tom Allman was works manager she was encouraged to walk down the main works corridor with a lit candle singing Jesus Bids Us Shine! In the early years she looked forward to going to the Plaza ballroom on Saturday afternoons for dances. Pip recalls that prior to the works dance the girls "would sit with our hair in curlers, but our heads covered with scarves - a factory rule. These occasions were looked forward to and were held at the Midland Institute. Bus loads of soldiers would be invited to our function and usually we would be invited back to theirs. The Second World War provided no shortage of soldiers and a good deal of fun was had by all." At the Christmas party of Christmas Eve 1947 the Telegraph reported that "Midnight carol singing by the male voice choir of the Royal Crown Derby Porcelain Co Ltd" was a feature of the entertainment! Phillip Robinson or Fred Finney appear to have been given the task of Master of Ceremonies. Linking arms at a Royal Crown Derby dance. From left Fred Bentley, Pip Bentley, Bill Corfield, Unknown, Cyril Thompson, Maurice Parnham, Unknown, Unknown. Pip recalls that "as young girls our wages were not high, but we would save up and buy a brooch and earrings set of pastel colour and with our professional sense of colour and our painting talents we would cold-colour paint these sets each time a new colour was required to complement a new dress or outfit." To alleviate some of the monotony of the work the girls would create their own entertainment. "We had a girl who sang solos and she would also entertain the gilders. Poems and descriptions of the latest film at the local cinema were given, this being the age of the Hollywood film star with all the glamour and escape it created." As some of the work was piecework - i.e. based on the number of roses painted, the other girls would make sure that the performers' work was kept up to prevent losses in wages. With none of the modern conveniences of air conditioning and a proper heating system, an uncomfortable working environment could be a particular issue. "Summer could bring its problems, but here again the practical Midland girls made large paper hats from the waste from the lithographers department and subsequently we looked more like nuns. The added heat came from the glass roof and windows as light is essential to decorating. To cool our feet we filled large tureens with cold water and then we had foot-baths! When winter came we had hot plates from the kiln discretely placed in our jumpers." Factory visits, especially by celebrities, also provided some light relief and excitement. On the occasion of the visit of Princess Elizabeth in 1949 Pip was sent home to Melbourne by her Supervisor Joan Midgley to fetch roses from her garden to decorate the tables. Works visitors were often known to pick up items still wet and unfired which did result in a need for a fair amount of restorative work after they had departed! Pip demonstrating her skills during a factory visit. Director Colin Osborne is on the left. At the time Pip started at the factory, marriage very often meant the end of that girl's employment. An impending wedding was celebrated by decorating the benches using hoops from the barrels which were originally used to pack and transport the china. She recalls that it was the "custom to raise two shillings per head and to get a half tea set in white. I still have mine." 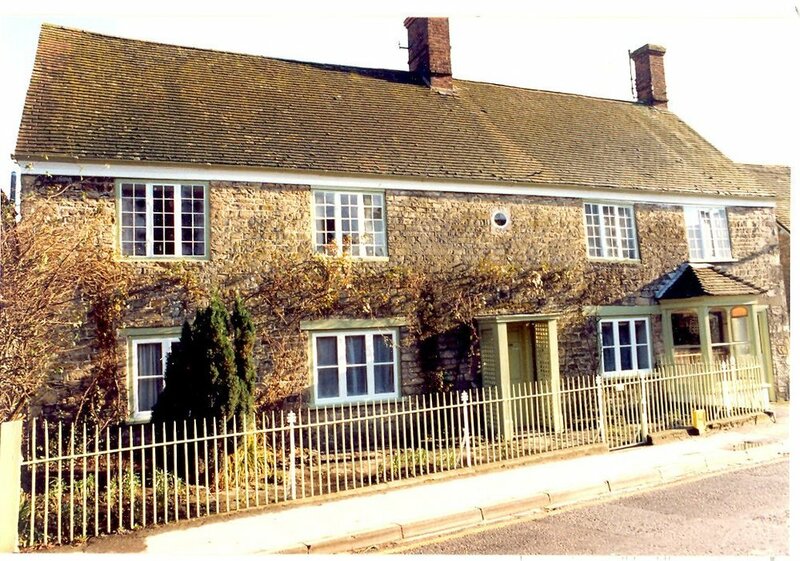 After the departure of Decorating Manager John Price in 1949 the enamellers began to sign off work on their own account. Both of the above pieces are signed by Pip. In hunting scenes it was her usual practice to paint her name along a blade of grass. Figurines and jewelry were usually initialled "B B" in whatever colour she was using at the time. Prior to 1949 her mark had been the letter "A". A selection of figurines all painted by Pip with an image showing her mark. A bird figurine would need about four to five hours work to enamel, with a plate and tankard each taking about three hours. Two firings were normally required in respect of the enamelling, especially if red was needed, (as was invariably the case with the hunting scene plates), as this fired at a different temperature and was liable to turn brown if fired incorrectly. A unique hand painted plaque painted by Mr H C G Jacob and presented to Pip by him in 1957. One of two brothers, H Jacob worked at the factory 1951-59. The underglaze factory mark on the reverse dates the body of the piece between 1887-90, so it had presumably been languishing in the glost warehouse for as long as sixty years before it was actually decorated! Pip's talent was such that she progressed from painting roses on Posie to the flowers on the figurine bases and on the brooches and other floral pieces. She went on to paint the birds and other figurines, and in the mid to late 1950's she was appointed enamelling Supervisor. Life was not always plain sailing. She recalls that on one occasion as Supervisor she "collected biscuit blue instead of the mauve enamel used in decorating colour "Aves" (Pattern A549). The result was a complete disaster the other colours gleaming, but oh dear! the substituted mauve was more akin to cement". Pip remembers that production did not always run as smoothly as was hoped. If the ware was not stacked correctly it could shift and jam in the kiln which had to be turned off and allowed to cool before the truck could be removed. On one occasion where a problem occurred in one of the smaller kilns she describes the resultant molten mass of plates as "like a fountain". A pair of Pip's palette knives. The lower one is well worn though use. A design for a teapot. Phillip Robinson would present a sketch of a design to Pip and ask her to prepare a finished version so that a litho could be produced from it. A teapot of this design was manufactured but never went into production and Pip was given the trial piece. Pip drew some of the first designs to be lithographed. Pip continued working at the factory long after the period covered by this website. She met and talked to several members of the Royal Family as well as other important visitors including the broadcaster Richard Dimbleby, Margaret Thatcher and Lord Snowdon. She also worked on Royal commissions including a plate she decorated for the Queen Mother in 1971. She was also entrusted with the task of delivering a special order of three plates to Buckingham Palace. Pip retired after a forty year career with Royal Crown Derby in 1987. This blog has been prepared by reference to Pip's contribution to the revised edition of Royal Crown Derby (John Twitchett and Betty Bailey 1988), to articles which appeared in the Derby Telegraph Bygones section of February 4th and 11th 2013, and an interview with Pip in March 2017. John and Val Robinson 2018. 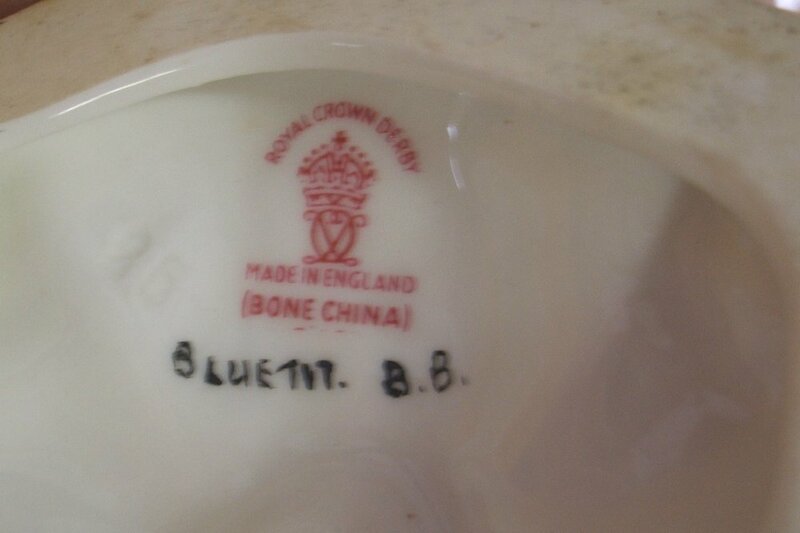 Betty started work at Royal Crown Derby as an apprentice gilder on June 4th 1934. In her excellent book “Gold in my Veins” Betty records her experience of working at the factory. At this time an Apprenticeship lasted for a period of 5 years. Previously the parents of an Apprentice had been required to pay for the Apprenticeship, but by this time the company met the cost, retaining a small percentage of the Apprentice’s total earnings by way of payment until the end of the 5 year term. The working day began at 8.00 a.m. She would collect a brass token from the Lodge and place it in a slot in the wall to record her attendance. She was taken to the apprentice gilding room to meet Miss Meakin, the head of the training department. She describes the training room as “Rectangular with six tall windows on one side and opposite were deep shelves of pens as they were known used for storage. Below each window was a long, scrubbed wooden table with three-legged wooden stools either side”. A typical class at this time consisted of twelve girls, two beginners and the rest older and at different stages of development. She was given a white cup marked “workman’s use” and fitted for the correct height stool “as it was most important that we sat comfortably with the elbows just resting on the table.” Part of her training involved the use of the banding wheel, a very difficult skill to master. Apprentices were taught to mix colour – “best red” being used instead of gold during the training process. This had an iron ore component and was about the same weight in the brush as gold. She was given a squirrel hair brush about three quarters of an inch long with a very fine point. She explains that learning to control the brush was of utmost importance and “took quite a while”. The brush needed to be long to hold enough colour (later gold) to both maintain the intensity and complete the intricate strokes. As she gradually controlled the long brush more intricate patterns were introduced together with the different shape plates and an extensive range of hollow ware items. Chores included sweeping the stairs and cleaning the room. Two girls took it in turn each week to collect hot water in buckets from the plate makers' department. This had to be carried up two flights of stairs. White cotton waste collected from the maintenance department was washed and dried and then used for removing gold strokes which were not up to standard as well as cleaning gold from the gilders' fingers and all equipment and tables. This precious waste was then collected in the gold grinding room and sent off to the smelting company for recycling. Betty worked a 54 hour week, 8.00 a.m. – 5.45 p.m. each day with an hour and a half lunch break. On Saturdays she worked 8.00 a.m. – 12 noon. Miss Meakin was prepared to leave the girls to their own devices from time to time, which resulted in some lighter moments amongst the gilders. She was considerate enough to make sufficient noise outside the room on her return to give them time to assume a focused composure! “Work from the Women gilders was taken to the same kiln but was placed into a room we called the 'receive' where it was checked for quality and for any marks which would then be cleaned off. Gilding being the final decorating process it was so easy to leave a tiny mark on the back of the plate or inside a cup which if it was fired on would need polishing off, a costly operation using a lathe which of course added to the eventual price”. She describes the use of the banding wheel as follows: “The floor standing wheel was positioned to the left in order that the right arm could rest on the table as we turned towards the wheel holding the liner, a long wedge shaped brush, but before we actually got to using the liner we had to master the art of centring the plate, which means placing the plate on the wheel and turning it fairly quickly, gently tapping the edge until the plate appears to be standing still which means that it is exactly in the middle of the spinning wheel. We were learning to paint fine lines, sometimes two placed closely together, so it was therefore essential that the plate was centred correctly. It was also very easy to send the plate flying off that same spinning wheel – one or two ended up on the floor. The secret of lining and edging was having the ability to keep the wheel turning smoothly with the left hand whilst holding the liner in the right and applying a gentle pressure to the plate trying not to vary the pressure at all or the line would be of irregular width”. The banding wheel was so vital to the process that Apprentices who could not master it were reassigned to the enamellers' department. After immersion the china was cleaned of its protective coating. “This is where we juniors came in, for as there were no apprentice males it fell to females. The actual process was to wash each piece in a bath of turpentine and rub until all the tar disappeared. I don’t think rubber gloves had been invented, at least we didn’t have any provided but what we did have was home made treacle toffee provided by Mrs. Dean and French chalk to soothe our hands which became sore very quickly. It was a messy, smelly process but we gradually became used to it." It was at least twelve months before Betty progressed sufficiently to be able to work with gold. When the day came she was “given a glass tile about 6 inches square and a new fine brush similar in size to the one I used on my first day.” From now on the “best red” which she had used to practise with would be used to identify her mark – in her case two small dots side by side placed to the left hand side of the trade mark and in the shadow of the foot rim, placing the pattern number above it where applicable. Apprentices were generally given the edges of the Posie pin trays to start with. They had to take care not to smudge the hand painted rose which appeared in the centre of each spray. The aim was to progress as soon as possible to be able to work on a piece-work basis. By then they were “judged proficient enough to know how much gold we should use in a day and ask for one or two 'tots' accordingly when it was sent for. The amount of gold we used was counted against the amount of the work we produced, and anyone consistently using too much was asked to do a gold trial. There were many reasons why someone could be using too much gold without realising it, not just through carelessness. Applying the gold too thickly, too broad lines, too broad strokes in patterns for instance. If this was proved then the girl was usually transferred to another department. The gold trial consisted of being given an amount of Mikado to finish using just a penny-weight of gold”. Betty recalls the challenge of working on replacement pieces and on the coronation ware produced for Edward VIII and George VI. A cigarette box that on the reverse has Betty's characteristic two dot mark. With the outbreak of War, as Betty had an Apprenticeship, she was initially allowed to remain at Royal Crown Derby until she had completed her two years as an improver. She was then directed into war work, working “in the L.M.S. railway aircraft wing, three wagon manufacture and repair sheds which had been turned over to making aircraft parts”. Early in 1945 Betty returned to Royal Crown Derby at the invitation of Phillip Robinson to start a training school for gilders. There was a staff shortage as many staff had been directed to join the forces and during the war no apprentices had been engaged. To encourage new apprentices to join the factory they were paid wages of £6.50 per week and relieved of some of the more tedious chores such a sweeping the stairs. The junior gilders room was relocated to the ground floor adjacent to an area where a new continuous firing electric tunnel kiln was to be installed. The new room had overhead windows and two large tables seating six girls at each. Post war improvements included new cloakrooms and a canteen providing snacks and a midday meal. Some of the old processes including acid etching had ended. Holiday entitlement at the time was one week per year in addition to Christmas and Easter. The new electric kiln was in place in August 1946. “Production increased almost immediately because the trucks which conveyed the china through this continuous firing kiln had to be filled to capacity in order to maintain the temperature. The trucks were conveyed automatically therefore as one was filled and was placed into the kiln another one whose wares were now fired, came out the other end. This meant that it was much easier to fire a piece at each stage of the process. The hand painted roses on the Posie pattern could be fired before gilding and factory marks similarly to prevent smudging. The new kiln was not without its problems. If a stack of cranks toppled in the kiln a truck could be come stuck and the whole truck load destroyed. At this time work started to be put out to out workers, especially gilders. Pre-war it was the practice that when any girl married they automatically left work. With no apprenticeships during the war the firm was left with just a few seniors and a workforce of predominantly junior gilders. Some of the retired employees were sought out who agreed to help and as by now the firm had its own van, the ware could be delivered and collected. Betty was responsible for settling the wages of the girls who were progressing towards piecework and therefore producing saleable ware. 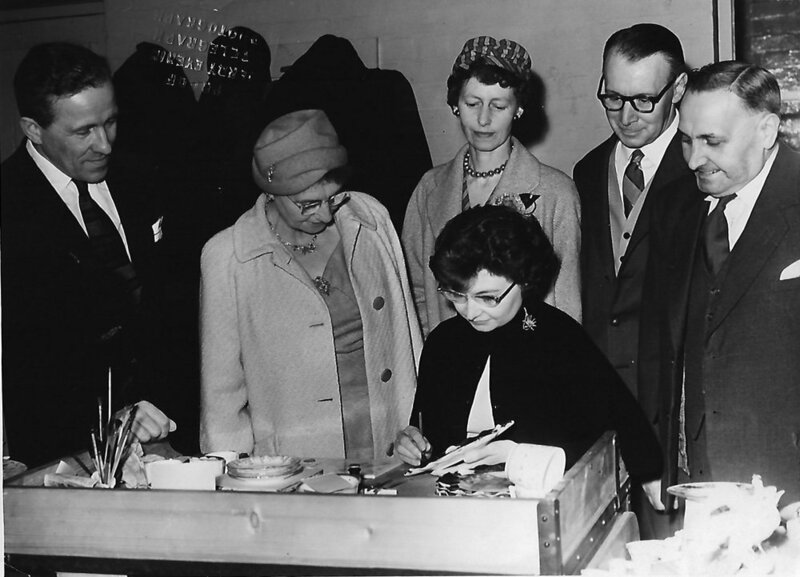 Betty appears in the above photograph of the factory visit by Princess Elizabeth. She is sitting with her back to the Princess in the centre of the picture and is gilding a Vine plate. Four were allocated a place to sit at the table, specifically set up for the visit; to give everyone an opportunity, a sweepstake was held for the places. Two of the winners other than Betty. were gilders, the fourth a beginner who had only been at the factory for two weeks. Betty remembers other visits, particularly those by “Gert and Daisy” (Elsie and Doris Waters) and Petula Clarke. Towards the end of 1949 family commitments forced Betty to relinquish her teaching post and work from home. Such was her skill and experience that she was asked to gild the more demanding pieces including the tall and low peacocks which had previously been the sole responsibility of the male gilders. She also worked on the ware produced for Kuwait including the 57 inch diameter huge rice bowls which were so large that the mould makers were unable to model the usual embossed edge and it therefore had to be drawn out by hand before it could be gilt. Toward the end of 1959 Betty was able to return to work at the factory and started a new training school at the beginning of January 1960. This was located in a small room formerly used by the engravers, and six girls started all having left school at Christmas. With the addition of further school leavers she soon found that she was in charge of two groups, and the first progressed so rapidly that it was entrusted to gild a set of 24 dessert plates in pattern 2451 commissioned by the Governor General of Australia. In order to provide a safer working environment and introduce modern more efficient working practices, the internal layout of the factory was radically changed to create a large open plan room with conveyor belts to transport the ware around the building. Betty's junior groups were moved into the main factory to work alongside the enamellers, senior gilders and burnishers, and she was put in charge of all junior and senior gilders, with the specific aim of improving the quality of the senior gilders' work. It is fair to say that this change in working practices gave rise to some significant resentment among the workforce, particularly the gilders. It had been the custom for work to be divided equally for fairness. The introduction of a felt roller to apply the gold edges to plates and saucers in patterns such as Mikado meant that only the cups, which needed a great deal more time and skill, appeared on the conveyor. As the gilders were paid on a piece-work basis, this had an adverse effect on wages, at least initially. Betty also found that she had to adapt her management style to cope with a situation where two decorating departments with different supervisors were now working alongside each other. It is a credit to Betty and her colleagues that notwithstanding these issues the quality of the work improved. Betty and her senior colleagues devised procedures to check and adjust or revise the ware before it was fired. Betty's career continued long after the period covered by this website. With the introduction of silk screening in the early 1960's the transfer printing process became obsolete. Betty was tasked with painting the Imari designs onto sheets of permatrace which could then be used to make the silk screen transfers. She realised that this would inevitably reduce the number of gilders required to do the finishing off of such work but "there was little I could do about it." In 1972 she was asked to work in the factory Museum alongside John Twitchett, as assistant Curator, with an early task of listing and describing the patterns and shapes, research which was included in her book jointly written with John Twitchett first published in 1976. Her duties included holding Open Days and escorting Museum visitors. The same year she travelled to Chicago to demonstrate her gilding skills as the firm's representative at "British fortnight" an exhibition of all things British. In 1977 she completed a five week tour of Canada and America. Betty retired in 1984 after working for fifty years for the business. In 2008 Betty published an account of her time at Royal Crown Derby entitled "Gold in my Veins - my life as a Derby gilder." It is an invaluable resource not only for collectors, but also for social historians interested in the experiences of women in the workplace from 1934. In the immediate aftermath of the Dunkirk evacuation in June 1940 Gillingham Tailor, Arthur Shephard pulled over in his Austin 10 to offer a lift to a bedraggled young soldier thumbing a lift to get back to his unit in Warminster. As a veteran of the ill-fated Gallipoli campaign Arthur recognised a kindred spirit in desperate need of assistance. 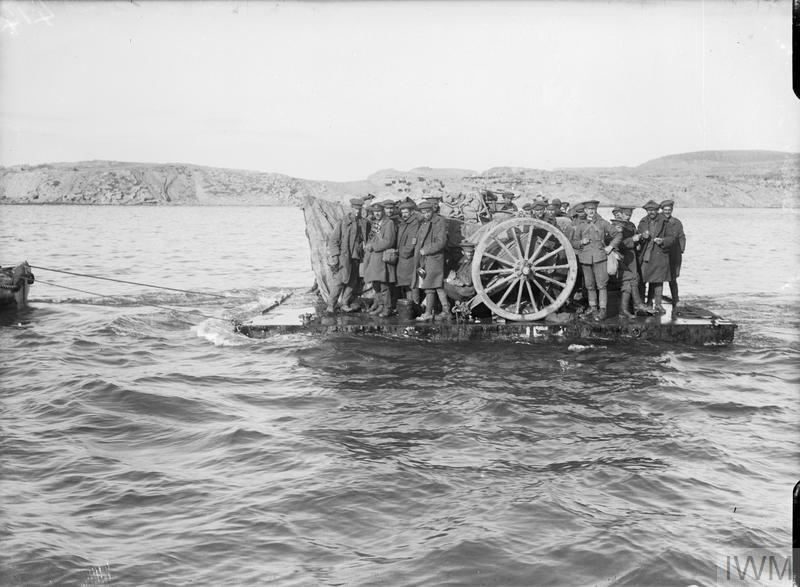 The first image taken during the Gallipoli campaign shows British troops and their artillery guns being evacuated from Suvla Bay on rafts in daylight, December 1915. Covering aspects of the 1940 Dunkirk evacuation, the second shows three of the armada of 'little ships' which brought the men of the British Expeditionary Force from the shores in and around Dunkirk, to the safety of British warships and other vessels. 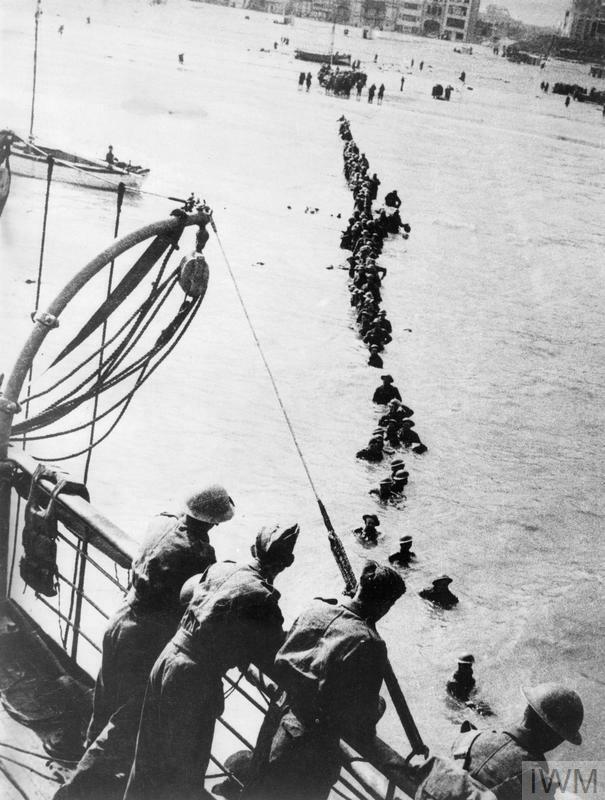 The third photograph shows British soldiers wading out to a waiting destroyer off Dunkirk. Exposed and vulnerable, lines of queuing troops were bombed and strafed whilst waiting to be evacuated. The final picture depicts British troops crowding the deck of a Royal Navy destroyer at Dover, 31 May 1940. Images are Courtesy of the Imperial War Museum. 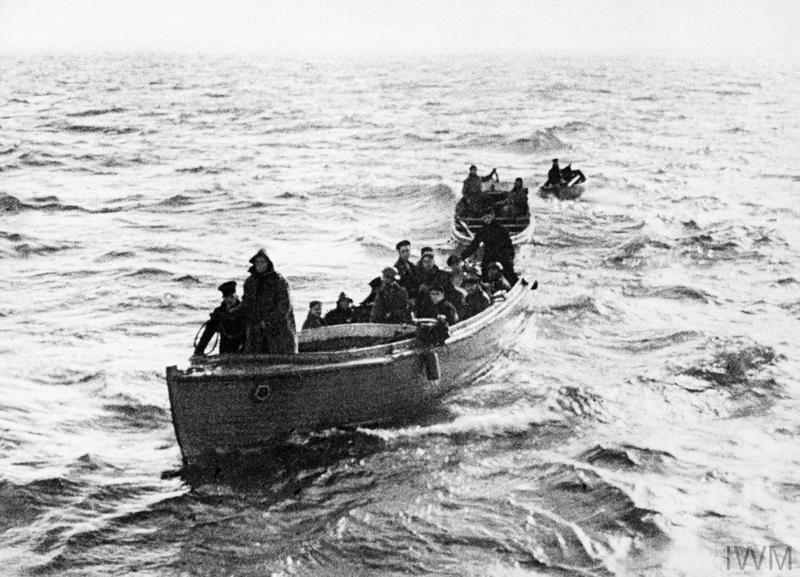 See http://www.iwm.org.uk/collections/item/object/205193298 and http://www.iwm.org.uk/history/7-photos-from-the-dunkirk-evacuations. It transpired that the young soldier was Harold Robinson's eldest son Eric, and it is clear from the letter that he was very appreciative of Arthur's kindness. Despite the spelling errors and lack of detail in the address, thanks to Royal Mail and the greatly reduced size of the population in Gillingham at the time the parcel still made it to the intended recipient. 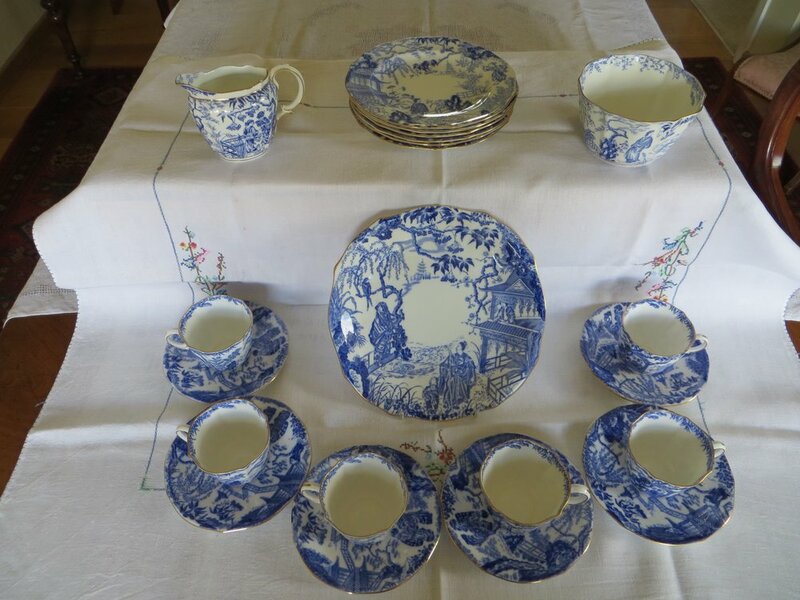 The tea service in the Mikado pattern is pictured above (Images courtesy of John Shephard) and occupied pride of place in the drawing room of the family's house and business in Queen Street, Gillingham (see image above). It would have been regarded as a very significant gift at the time, as Board of Trade restrictions prevented the sale of decorated ware in the home market and this pattern was only produced for export. In a recent article by journalist Michael Streeter in the Gillingham News, Arthur's son John is quoted as saying that his father's action "was very much in character actually. My father was a quietly good man. My parents rather treasured the set, it was something they were very proud of. I would never part with the tea service, it means an awful lot to me." Eric did not talk about his experience at Dunkirk, completing his war service and subsequently returning to Derby. There he worked in the family business, managing the "clay end" of the manufacturing process until he left to move to Uttoxeter in 1953. John and Valerie Robinson September 2017. I am delighted to announce the addition of a new page "Shapes, Catalogues and Brochures" to provide further assistance to those wishing to identify patterns, and most particularly, shapes. I have also begun to add representations of those patterns where pattern numbers are known but where pieces have not become available. Joan in charge of her department. Brenda “Pip” Bentley is situated to the right of the girl to the bottom right corner. The two girls to the centre on the left hand side are rose painting, the two nearest to Joan are painting the flowers on the lids of round covered boxes. Joan at the time of the factory visit by Richard Dimbleby in 1950. Her son Martin recalls seeing a 78 recording of the broadcast but it has been lost. The BBC does not have one it its archive. If anyone is in possession of a copy I would very much like to hear from them. Staff Dinner of unknown date and we are also unsure of the venue. We do know that it must have been taken prior to 1952. Joan appears in the top right hand corner. Joan at a staff dinner which was probably held at the Traveller's Joy, Shelton Lock, (Now Golden Pheasant) which was owned and run at the time by Miss Francis and Royal Crown Derby artist Cuthbert Gresley. A photograph apparently taken at the same event. We are still trying to establish her identifying mark, but during the period that she was in a training role she would not have needed to mark her work. Joan left Royal Crown Derby to look after her son Martin Tanner in April/May 1956. She died in 1998. In August 1932 at the age of 14 I applied for a job as an apprentice paintress at the RCD. After a successful interview I was told to report on Monday at 7.45. On reporting to the lodgeman I was taken to Mr Turvey who was the Decorating Manager. The buildings were just the same as when it was the Derby Workhouse. I was to train in one of the dormitories. Mr Turvey took me up two flights of spiral stairs, badly worn by the inmates. The room was long and narrow white washed walls seven small windows each with bars. A bench under each window, and a pot stove in the middle. At one end of the room there was a screen, a chamber pot and a jug of water to wash your hands. Mr Turvey took me to Miss Broughton she was the first woman apprentice at the RCD Osmaston Road and was over eighty years old then. She informed me of all the Do’s and Don’ts, we were not allowed to eat or drink in the work room, if we wished to go to the toilet we had to put our hand up for Miss Broughton’s permission and we had to go alone. There was another girl starting that day her name was Edith Hill. Her family had come from the potteries, her father was to be the new Clay End Manager. There were fourteen other women in the workroom, some quite old, they were all misses, as married women did not go to work in those days. Miss Broughton gave us a three legged stool and indicated at which bench we were to sit. Our ‘tools’ a tile, turpentine, oil, paint, a fine brush and a white plate. We were told to take care of our brushes as in future we bought our own 11/2p for tracers 2p for shaders 1/2p increase according to size (old money). Miss Broughton sat at the end of the middle table on a chair raised on a small platform. We stood at her side while she demonstrated some strokes on our white plate and then told to copy them. This we did time and time again, only to be told to wipe it off and do it again. The white plate was the only piece of china I worked on for three month. As apprentices we had to empty the stove of ashes and take them down two flights of stairs and bring back two buckets of coal every day (no central heating then). Friday was cleaning day, windows were cleaned, benches scrubbed, floors mopped and stairs washed. There was another thing we didn’t like on Friday, bones were brought from the Derby abattoir boiled, incinerated and then ground as one of the China’s ingredients. My wages for the first year were six shillings and threepence (32p in today’s money) per week. After working on the white plate we progressed to working on miniatures again the procedure as the same, practice and practice until Miss Broughton considered us good enough to do work. First small pieces and then gradually larger and more intricate patterns. Every piece was closely examined before it was passed to the kilns for firing. We got to know when orders from big American stores were expected hoping they were large enough to enable us to work full time. The American stores were Tiffany’s and Plummers had their own names printed under the RCD stamp. The bottleneck kilns relied on coal for heat and the skill of the men who fired them. There were holes round the ovens for the men to draw out trials to check on the correct temperature. In 1939 the war came and things changed. All women were released for war work with the exception of Miss Gerard, a Gilder and myself as the paintress. I was encouraged to learn from the men painters Mr Mosely, Mr Gregory, Mr Dean and Mr Gresley, Mr Haddock was the Gilder. Mr Mosely wore knicker bockers and was quite a character. They all had one thing in common, perfection. During the war we had to fire watch one night a week at the works. The team included Mr P Robinson Works Manager, Alec Wainwright Decorating Manager, Bill Morris Clay End Manager, Mr Ken Peake Works Secretary, Connie Polkey and my sister and I. We were as much afraid of the cockroaches as the German Bombers. When the war ended we had parties to celebrate the victory. I retired from the works at the age of 37, when my son was born. I worked from home for quite a few years after. My father worked for the old North Staffs railway in Stoke and was moved to Derby when the LMS amalgamated. I suppose I have a feeling of nostalgia about china, as the old railway men have of steam trains. Times change production methods change, but the RCD still produce beautiful china. J Tanner, nee Midgley, nee Ravenscroft"
The photographs and Joan's recollections have very kindly been supplied by Martin Tanner from his family archive. Left hand side, front to rear – Doris Wood, Gwen Smith, Peggy Fox/Laura Guertin, Barbara Elton, Margaret Gadsby, Margaret Millinger, Jack, printer. Right hand side, front to rear – Edna Pountain, Joyce Evans, Mary Adams, Edna Jessop, Violet Branbury, Mrs E L Braine, Lucy Barker, Pat Chittendon, E Beer, Beatrice Smith. Rear centre on right, Raymond Russell printer, to his left Eddie Barker (husband of Lucy), printer. This photograph was taken to record the development of the new Biscuit Printers Workshop and dates from about 1941 when Laura was 15. Laura, a pupil of Reginald Street High School, joined Royal Crown Derby soon after war broke out at the age of 14 as a Transferer’s Apprentice. It was the practice for local schools to arrange tours of the factory with a view to future employment. The photograph was staged: normally work was carried out at four separate benches in teams of four, two apprentices, a transferer and a printer. Only half of the room is shown in the photograph. Typical of the time, without lockers, coats were hung up along the back wall. Initially, in her team the printer was called Frank, a first world war veteran. Frank retired to be replaced by Raymond Russell who appears in the photograph above. Printing took place behind the part-glazed partition at the rear of the picture. The printer's colour was warmed on a stove and applied to the copper plate engraving by the printer using a spatula which forced the colour into the engraving whilst removing the surplus. The plate was then covered with dampened tissue paper and passed between the felt-covered rollers of a press which removed the moisture from the paper forcing the pattern onto it. It is just possible to see one of the presses in the background. Clearly throughout this era there were specific designated roles for female and male members of staff. Laura was taught to carry a dozen cups on one arm and piles of plates and saucers, the ferrying of ware to and from the warehouses forming a significant part of her duties. The ware had to be dusted before the transfer prints were put on subsequently rubbed down firmly using a special tool with a black end. When the pattern was secure the tissue backing papers were soaked off in vats of water before being placed on a draining board to dry. One of the first tasks Laura learnt was applying factory marks which came as printed sheets, the marks cut out and centrally positioned using a template. Sheets with a different date cipher were used at the beginning of each year. Apprentices were also given the unpleasant task of removing any spots on the pattern with a pumice stone dipped in turpentine, flaws caused by nicks in the copper engraving plates used to print the patterns. As well as obligatory tea making duties, Laura was also tasked with cleaning the engraving plates, kept on the second floor next to the Engraver’s shop. This required her to carry buckets of water up two floors, a particularly detested chore. Harry Short was the engraver at the time. Later she was promoted and tasked with applying the printed pattern to the ware, requiring considerable skill to ensure it was an exact fit. She recalls her firewatch duties which were organised on a six week rota. Her group of four ladies took over Phillip Robinson’s office setting up camp beds around the fire. They were instructed on how to extinguish an incendiary bomb using either a stirrup pump or bucket of sand. When the sirens sounded they were required to put on their tin hats and carry out their duties. Understandably nervous as a novice, her watch stood in a group at the Employee’s entrance by the Ladygrove Cottages hoping nothing would happen, until an Air Raid warden cycled by demanding to know what they were doing. They replied “Firewatching the Royal Crown Derby” to which he responded “Well disperse - do you think Jerry’s coming up the Grove?” This broke the tension and they patrolled in pairs. Laura’s sister Betty Fox (later Crawford) worked in the Lithographers department together with her best friend Betty Smith (later Linnell). She still keeps in touch with Beattie Bates and Doris Wood. Doris appears in the photograph above. She regarded Fred Finney, manager of the best warehouse, with special affection. One day aged 14, as she was carrying a box of china which was a special order she slipped on a step and dropped the box. As she sat down on a step in tears, Fred came along, saw what had happened and said “Don’t cry there’s worst accidents at sea right now.” He replaced the broken pieces without any fuss. She has never forgotten his kindness. Just before the start of work at 8 a.m. on the morning of July 27 1942 a Dornier bomber flew at low level close to the factory. It had avoided the radar and the sirens did not sound. She recalls someone shouting “Under the benches everyone” but it happened so fast there was no time to react. Osmaston Road was machine gunned and a bomb was dropped on Rolls Royce, inflicting casualties. She recalls the visits of the American Soldiers whose “Understanding the English” tours resulted in gifts of gum and chocolate. She particularly remembers a visit by Dame Anna Neagle. She recollects that a young man named Ernie Browning painted dogs on ashtrays during this period. (See an example of his work under “Country Pursuits”). Most of Laura’s work was centred around the production of the Blue Mikado and Avesbury ware produced in considerable quantities for export under the US Government Lease Lend Act. When aged seventeen and a half and wishing to experience life outside the confines of a factory and escape the all-pervading smell of turpentine she applied to join the Land Army. She was stunned to learn that she could not as she was already in a reserved occupation, her work at Crown Derby essential to the war effort. Laura left Royal Crown Derby soon afterwards at the end of the war to take up a residential nanny position in Duffield. Emigrating to Canada in 1951 she returned to England in 1996, now living near Derby. Laura has written down her experiences at Royal Crown Derby and this blog is based on her account but edited for the sake of chronology. Thomas (Tom) Allman was factory manager from 1945 to c1950. Born in 1894 Thomas’ exceptional abilities were recognised by Harold Robinson: at 18 he was appointed as works manager at Cauldon in 1912. A photograph taken at the Ridgways (Bedford Works) Ltd in the period 1929-32. Thomas is on the front row sitting next to "Flossie", Harold Taylor Robinson's secretary. Eric Robinson is on the left hand end of the top row, with Phillip Robinson on the top row above "Flossie". Thomas eventually left the Cauldon empire to become works manager at Arklow Pottery in the Republic of Ireland, a factory which started production in 1934. Although the Republic of Ireland remained neutral during the war, Thomas faced considerable difficulties in securing the raw materials to keep Arklow operating. Two ships sent to secure china clay and coal were lost at sea. Upon the death of his wife, Thomas was persuaded to return to England by Harold Robinson and take up the post of General Manager at Royal Crown Derby in 1945. In a letter dated 30th March 1945 asking Thomas to join him at Royal Crown Derby Harold provided some significant and persuasive information: “Orders are positively rolling in, and during the past week they amount to approx. £7,000 from Canada and the U.S.A. The total on the books is over £80,000. Some orders considering we make nothing but fine china! A satisfactory feature is that a large proportion of them are for new lines introduced since we came to Derby and broadened Derby’s hold on the market, apart from any exceptional temporary demand due to trade booms. I think it fairly certain that we shall gradually rise from our present weekly packing figure of £1,100 to £2,500, which would be more than Cauldon and Coalport did together. Their joint packing in 1930 was about £75,000 per annum, but of course prices have risen 50% since then.” As a result Thomas accepted the offer of General Manager. Thomas’s signature is included in the Birthday Book of the 9th June 1947. He remarried on the 19th April 1948 and the event with photograph was recorded in the Derby Evening Telegraph. He was afforded the rare if not unique opportunity to hold the wedding reception in the Company Showroom. Thomas left Royal Crown Derby around 1950 to become General Manager at Wedgwood and Co., Tunstall. He returned to Derby and ran an Off Licence in Drury Lane. He died in the Derwent Hospital in 1964. Constance Clark, later Connie Davies, worked as a gilder from 1945 until late 1957 when she left the factory to take care of a relative. When Constance started at Royal Crown Derby aged 14, Mrs Ellis was the forewomen of the department. She worked on the very ornate services produced for the middle eastern market and recalls signing her name in the Harold Taylor Robinson Birthday book in 1947. 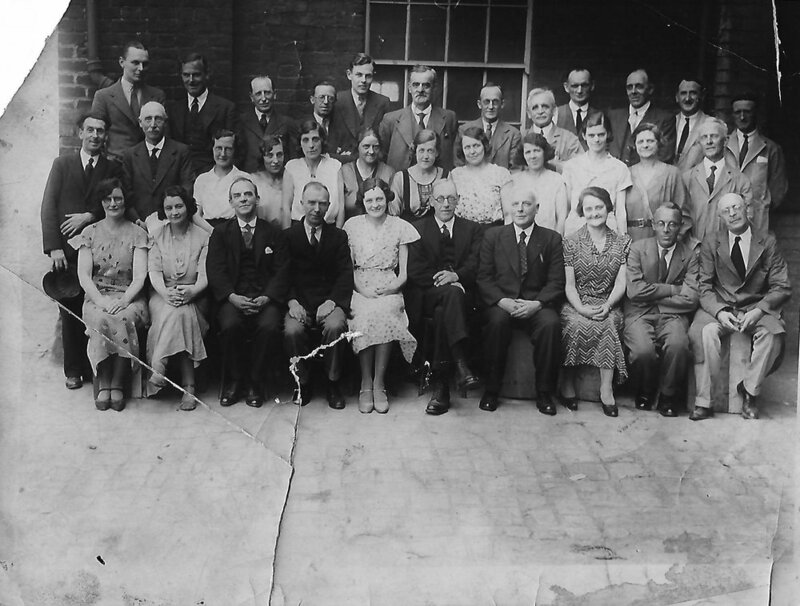 Constance is here in the 1949 staff photograph. There is some debate regarding the venue, some of the opinion that this photo was taken at the Railway Institute. A service plate in the "Edale" shape gilded by Constance with her identifying mark in derby red. Constance demonstrates her gilding skills to visitors on a factory tour. Although unsure of the date she believes that this photo was taken in the mid 1950’s. Does anyone recognise the visitors? If so please get in touch via the contact page. 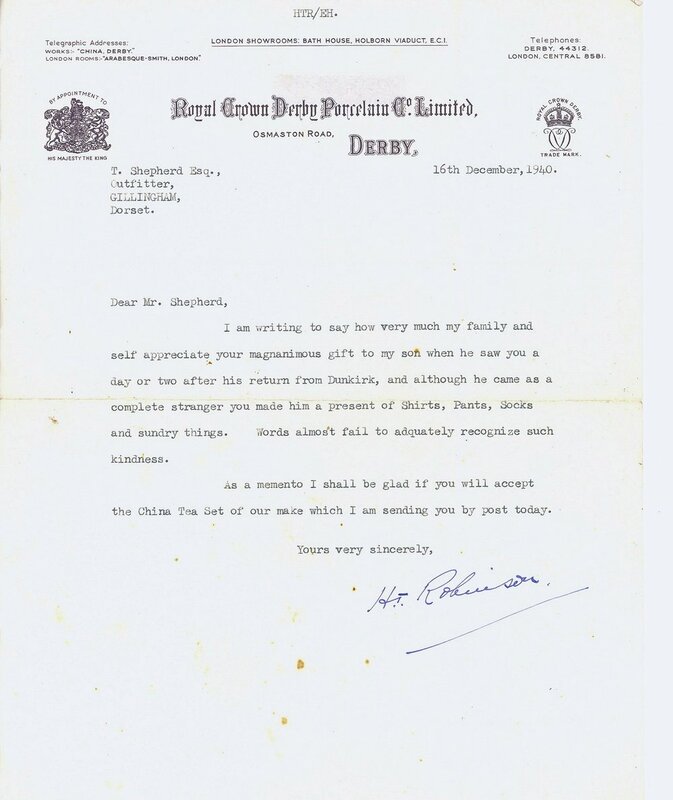 Following Jane Goddard's wonderful centre page article in the Derby Telegraph's Bygone's section highlighting the contribution of Royal Crown Derby and its staff during and immediately after World War Two, I have been delighted by the response. As a result I have been privileged to interview a number of those who made contact. Arising from this and with their full permission I shall post brief staff histories. These will include memories of their time at the factory as well as how they literally made their mark on the product for example gilder and enameller identification marks. This will be a first, their work from now on identifiable and afforded due credit. Indeed most women started as young as fourteen from the mid 1930's learning and honing their highly-skilled craft. Betty Wherry has advised that embossed ware required a higher standard of expertise: whilst it reduced time taken to set out as the pattern did not have to be drawn on the piece by hand, it was more difficult to gild over the uneven surface. Accordingly I have amended an earlier posting. I am indebted to Barrie Sheard who has kindly supplied photographs of his Royal Crown Derby rowing cup won in 1953 which features on the "Presentation Pieces" page. New features also include all the pages of the Harold Robinson 70th Birthday Book, four photographs a factory visit of which the details are unknown, and a page on the Royal Crown Derby cricket team, 1947-58. It enjoyed variable fortune. A study of pheasants by Donald Birbeck. I am thrilled to announce that I shall be releasing a 1947 list with 267 named staff/employees together with previously unpublished archive photographs on Monday 27th February. This is to coincide with an article by Jane Goddard in the "Bygones" section of the Derby Telegraph. Thank you to all who have emailed in response to this website.. I have responded to points raised and added to the content, particularly regarding the pattern pages. I recommend recent additions to “Presentation Pieces”. Please note that I do not give advice on value. It is great to note how ebay sellers are increasingly including pattern numbers and names when listing. As this website is freely available to all it should enable buyers to find the piece(s) they need. Such accuracy also has the advantage of finding relevant comparable transactions in the “sold listings”. This can be accessed using the advanced search option to provide a useful indication of what you might expect your item to sell for. I shall be adding a photographic archive shortly to include photographs of the workforce during the period. I believe that some images have not previously been published. Should anyone wish to submit photographs to be uploaded on this website with details of the department worked in and approximate dates I would be delighted to include them. I shall include more information relating to the history of the business. Identifying the numerous tableware shapes is extremely difficult, and I look forward to adding Information that should be of assistance. How did Royal Crown Derby manage to survive the war time years 1939-45 and grow its export business? In the book Royal Crown Derby by John Twitchett and Betty Bailey, the Second World War period is dealt with in one sentence “During the difficult war years, 1939-45, production was maintained, but mostly useful ware was made": (page 63 1988 Antique Collectors club). The list of new patterns set out in this website (some 400 during the period in question) and recent research now suggests that this was far from the reality. An article which appeared in the Derby Evening Telegraph on Wednesday 5th September 1945 (barely 4 months after the end of the war in Europe) gives a rather clearer indication of the level of activity during the period although it is acknowledged that the factory would have supplied this as editorial to the paper. The article begins “Throughout the war years stocks of the richly decorated Crown Derby China have gradually disappeared in this country, but production at the Royal Crown Derby Porcelain works in Osmaston Road has been maintained at full capacity to provide one of the most appreciated items in the maintenance of our overseas exports”. Despite the hyperbole, clearly rather more was happening at the factory during the war than either previous accounts or the Royal Crown Derby official website would suggest. This raises the question how did the factory manage to continue operations during this difficult period and successfully grow its export business? Clearly not by producing white ware alone, which is the most difficult to manufacture. Most plates have blemishes to varying degrees, and a pattern is a very useful way of concealing these so that ware can then be sold as first quality. The management of the business is clearly a significant issue. Harold Taylor Robinson was a very driven entrepreneur who had rapidly expanded his Arcadian business during the 1914-18 conflict when he had very successfully mass produced war related souvenirs. He had known very considerable success and equally considerable failure, and in 1939 had 40 years’ experience in the business. He would have had contacts in the US and Canada from his previous companies, particularly in respect of Cauldon, and had even registered patents in the US in 1929. By all accounts he appears to have been well respected by his staff (Page 35 Gold in my Veins – Betty Wherry). Although key operatives were taken for war work or drafted into the army he motivated the workforce and coped with available staff, a significant issue as faced with severe staff shortages, the RCD situations vacant advertisements appeared in the Derby Evening Telegraph throughout the war. The arrival of Phillip Robinson in 1940 who introduced an extensive range of new patterns. These are included in the pages below. These are mostly characterised by using patterns raised from the body of the article. Vine, Chinese Birds, Pershore and Kendal are particular examples of this technique. The resilience and loyalty of the remaining work force. Contemporary accounts reveal that working conditions in the factory at the time were often difficult. With reliance on coal fires for heating in the offices, working in the winter months was an ordeal until such time as pipes for a heating system were secured from a local scrap yard. Factory workers volunteered for fire watch duties and remained in the factory on a rota overnight to deal with the risk of incendiaries. The factory is near to the Carriage and Wagon works and bomb damage was a very significant risk. In 1941 two RAF personnel were killed at the rear of the factory when the band stand at the Arboretum took a direct hit. The kilns when cooled were used as air raid shelters and chimneys capped to prevent enemy planes from seeing the glow from above as firing usually took place during the night time (Page 22 Gold in my Veins Betty Wherry). News of colleagues when reported in the newspaper was not always good. On Friday 26th March 1943 Cpl E Leigh, 27 of 51 Yates Street and former factory employee was reported as missing in North Africa. On the 23rd April he was reported to be a prisoner of the Italians. Board of Trade restrictions were a particular issue. In a letter to the editor which appeared in the Derby Evening Telegraph of the 3rd June 1942 Harold Taylor Robinson was moved to let the public know that the Board of Trade price controls relating to “domestic white or light ivory earthenware cups, mugs, and beakers (tumblers), saucers, plates, meat dishes, jugs, pudding bowls, pie dishes and vegetable dishes” did not “apply to white bone china, the sale of which remains uncontrolled”. Although possibly coincidental, one could speculate that the use of a revised date cipher for the year 1941 (Ian C Harding Derby Porcelain International Society Journal 6) might have been prompted by a desire to confuse such ware with that showing the 1930-7 date ciphers, although in reality much that was exported lacks any date cipher. The maintenance of a quality product whilst at the same time introducing mass production techniques. The services of skilled artists such as Albert Haddock, William Dean, Donald Birbeck, William Mosley and Cuthbert Gresley were retained during the period. Jack Saddington would have been included in this list but the sad news of his death was reported in the Derby Evening Telegraph on the 23rd July 1942. Despite the war time restrictions thirty plate centres were designed by Donald Birbeck and were painted by Mosley to form a dessert service for an Indian Prince. The order was reported in full in a Derby EveningTelegraph article of Tuesday 18th February 1941. In this article Harold Robinson is quoted saying that “Craftsmanship built up Derby’s ceramic fame, and only craftsmanship will maintain it” Phillip Robinson attended a meeting in London to finalise the arrangements which coincided with a blitz. The order of 625 pieces in total was completed and shipped, but contemporary accounts suggest that it never reached its intended recipient, being lost at sea. Goods sent by sea, especially to the US and Canada by convoy, were always at risk, especially after the US entered the war December 1941. An exhibition of the flowers for an Indian Prince service was held at the China Room, Derby Museum commencing Monday 16th March 1942. On the fourth of April 1945 an article in the Derby Evening Telegraph reported the gift of a banqueting Service to the Corporation. Designed by Phillip Robinson the service comprised 1000 pieces in two patterns. Paid for by the Directors of the paper representative pieces were delivered to the Corporation, as reported by the Derby Evening Telegraph, on Saturday 10th November 1945. It would have been difficult to reveal the full extent of the activities at the factory during the war time period because of the risk of causing resentment in customers in the Home Market. However that situation changed with the ending of the Board of Trade restrictions on production for the home market in 1952. It is therefore rather surprising that the efforts of the workforce during the period are still apparently unrecognised. I intend to consider this and other aspects of the business in subsequent posts.